Here are some small kitchen design ideas. These designs are ideal for small urban homes where space is a luxury. Every house, be it small or big has to have a kitchen. It’s a place to cook meals, gather around, chat and have fun with family and friends. 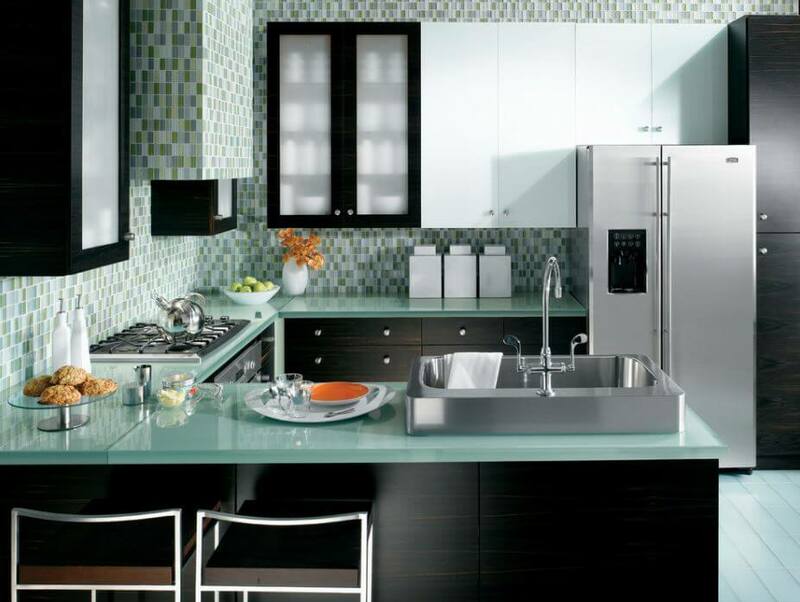 Go through these small kitchen design ideas and start designing yours. These kitchen designs will help you optimize space and plan a smart kitchen. This is a nice cozy kitchen design with dark wood cabinets. 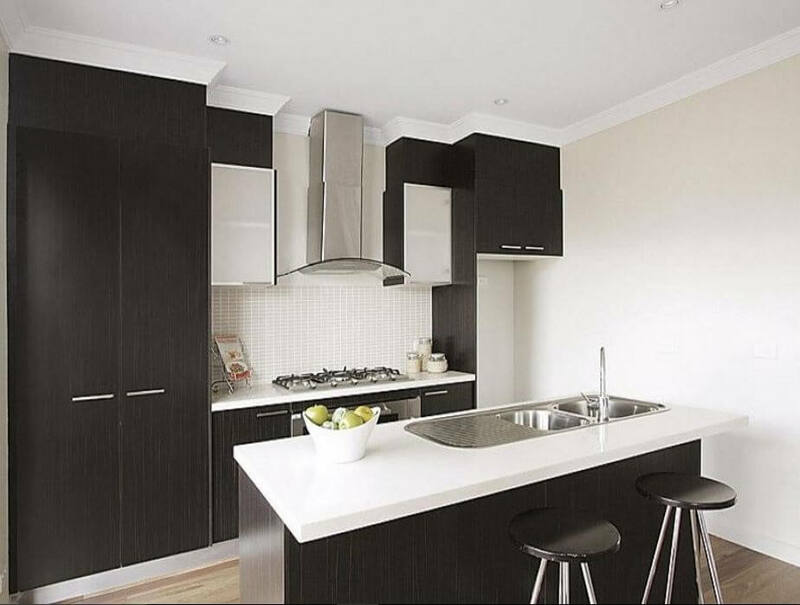 Go for custom-made cabinetry that incorporates your microwave, hob, sink and fridge in this impeccable manner. Check out these gorgeous small kitchen design ideas; they might come in handy when designing yours. 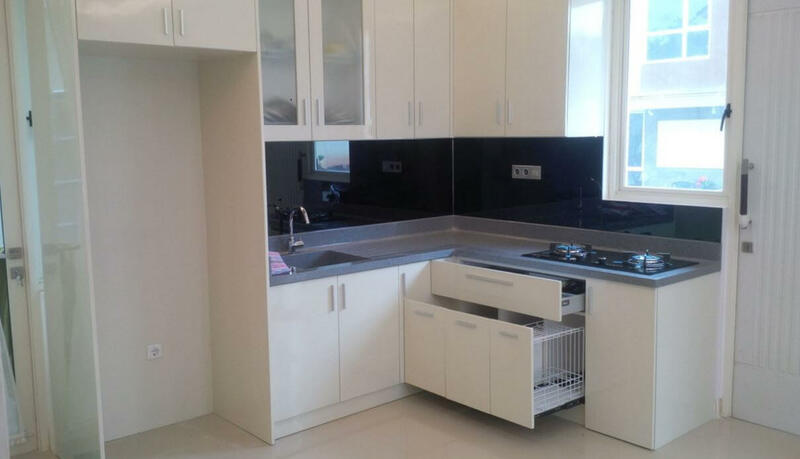 This kitchen is a perfect example of how to balance black and white color. This kitchen layout idea works well with small spaces. 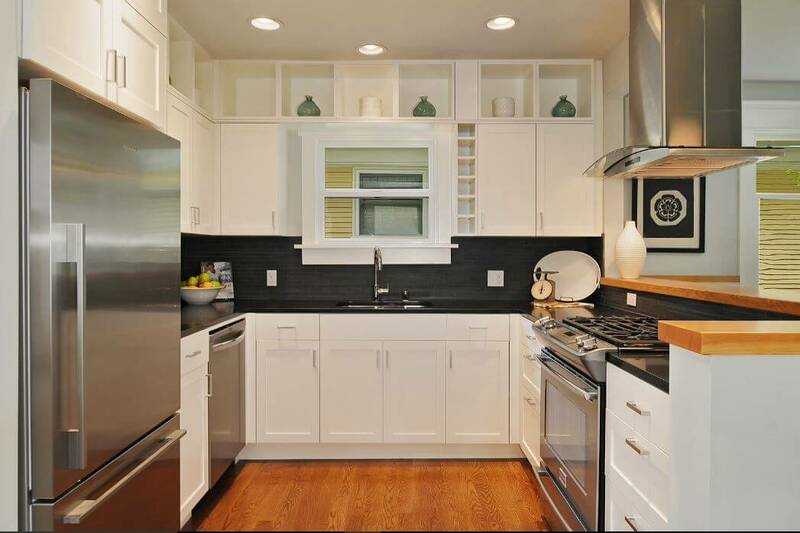 It is a compact kitchen with ample storage space and a cute breakfast nook. You need lots of drawers and cabinets for storage. 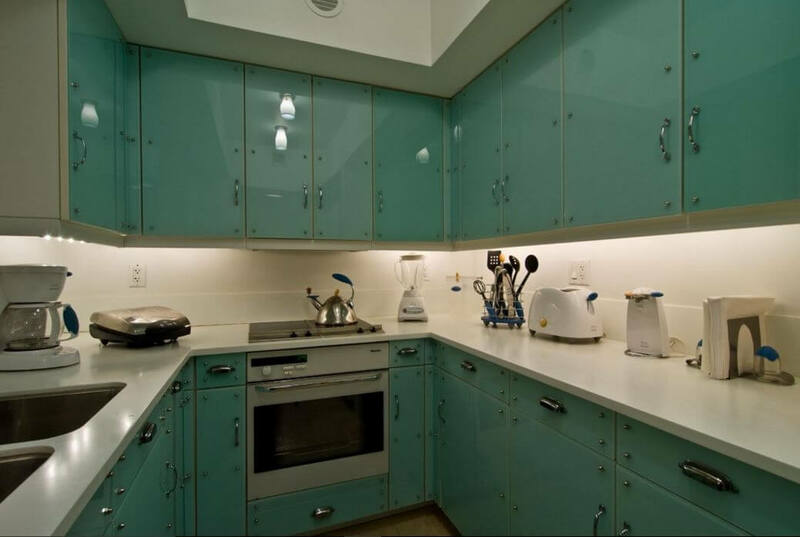 Here is a pretty green kitchen design that has loads of them. This is a narrow galley kitchen with some smart storage ideas. You can turn your window into a place for storing your glass and china ware. I love these chic small kitchen design ideas. 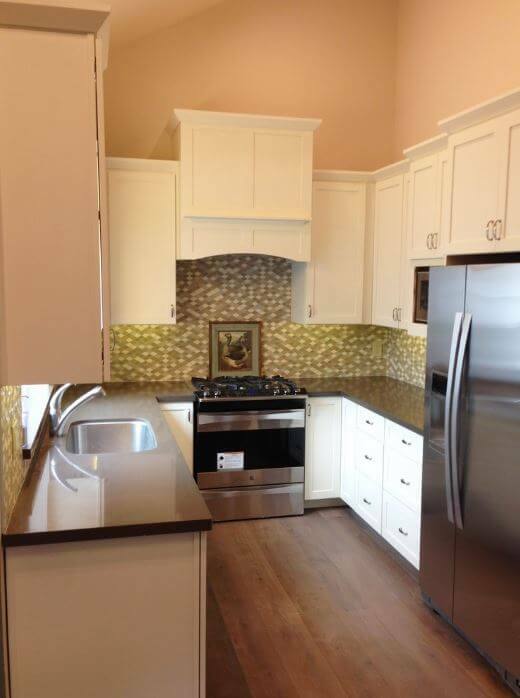 Glass is used throughout this kitchen – floor, countertop, tiles and cabinetry. A dash of color can go a long way. 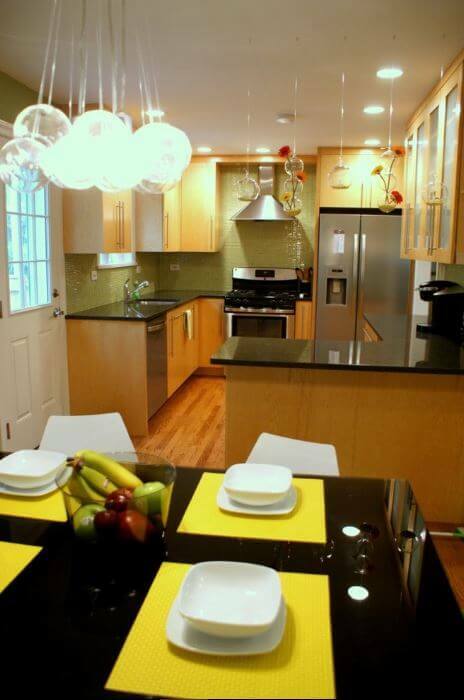 This is a very small kitchen but the bright color completely takes the focus off its size. Check out this U-shaped kitchen with wooden floor. 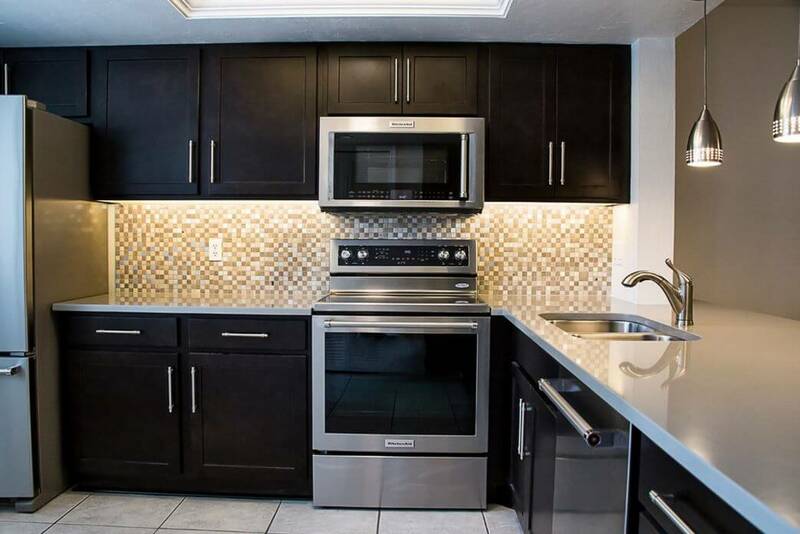 Go for sleek countertop and appliances that would fit into this small space. 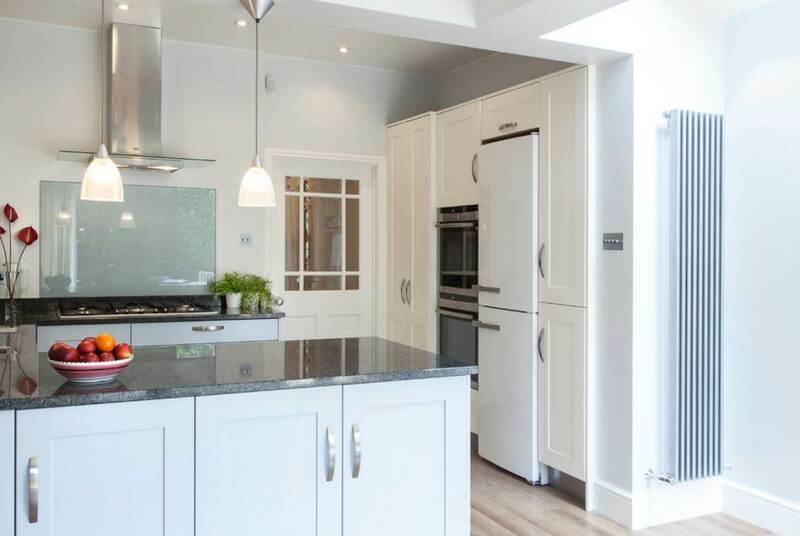 White can make your kitchen look crisp and clean. It creates an illusion of space and makes it feel more open. 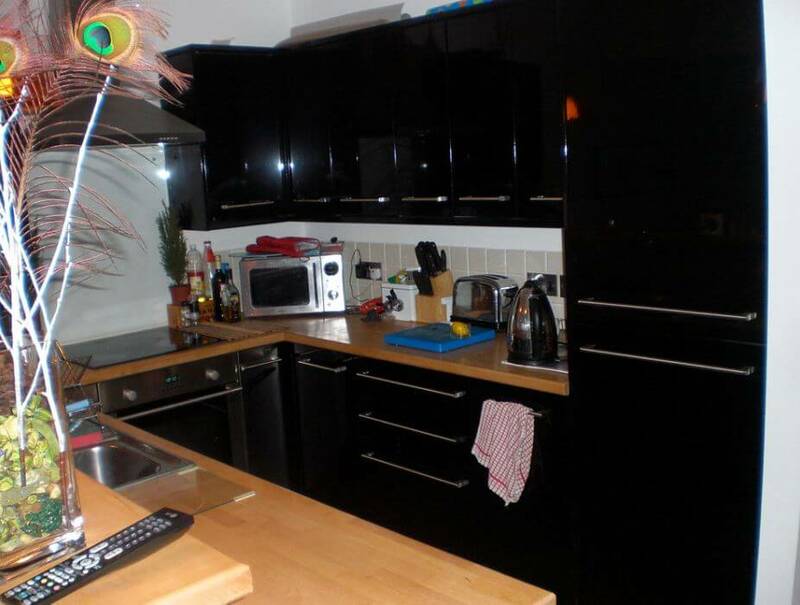 One can also workout a cool look for a small kitchen by using black color. Dark colors tend to make a place feel closed and cramped but by intelligent use of light colors you can easily avoid it. 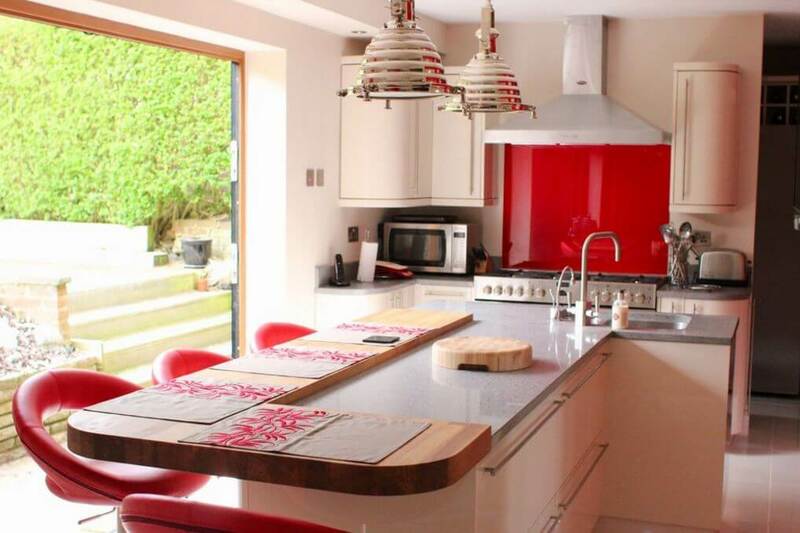 Brighten up your small kitchen by adding lots of lighting. This will not only enhance its aesthetic appeal but also make it more interesting to work in. 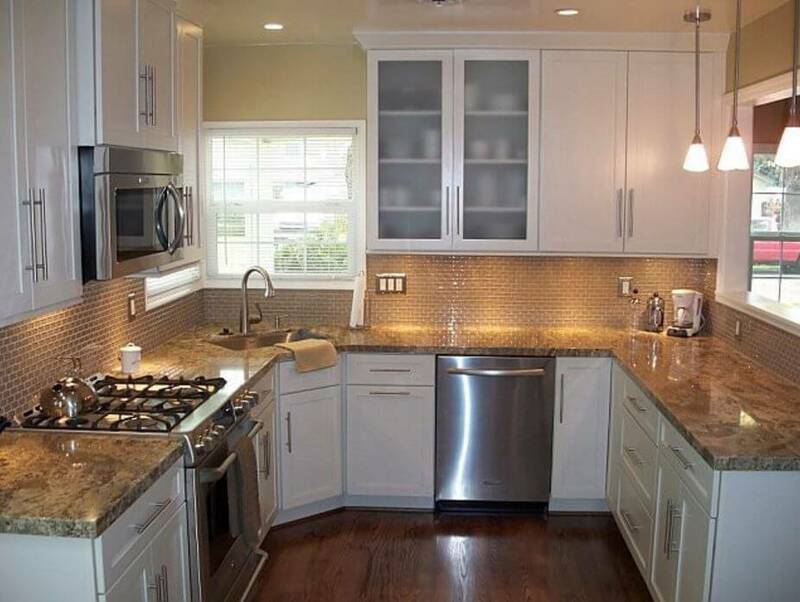 The shimmery glass tiles and the glossy granite countertop brighten up this small traditional kitchen design. This modular kitchen can fit into the smallest corner of your house. It is packed with storage and pre-assigned space for every gadget. 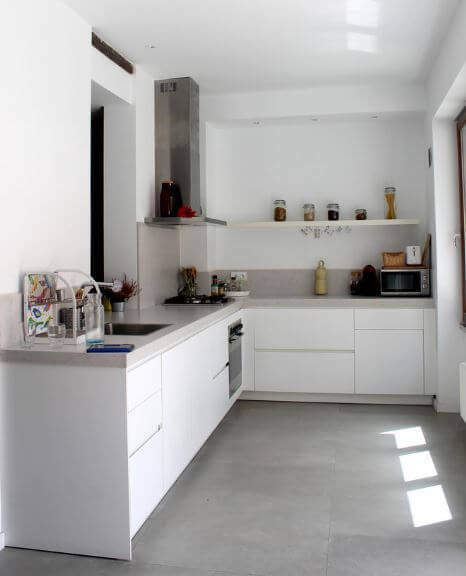 This is a clean, simple and functional kitchen design. This L-shaped kitchen is ideal for apartments and small homes. 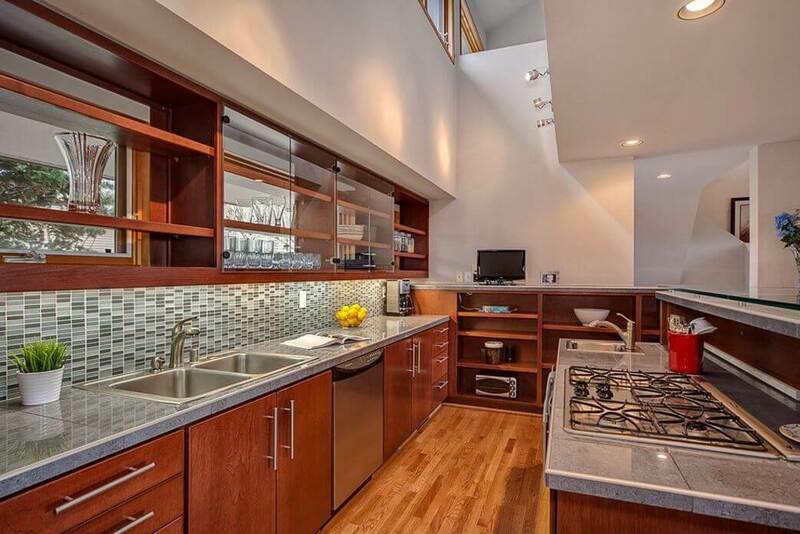 Love the curvy design of the countertop; it creates a seamless flow throughout. 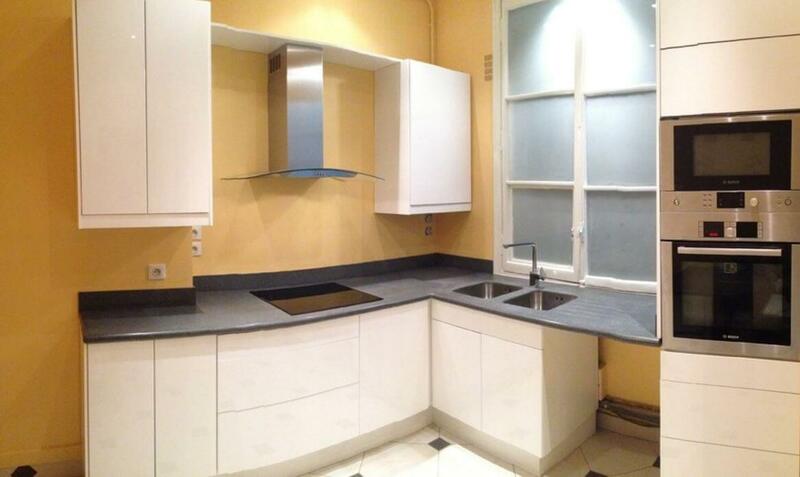 This kitchen will work well in homes with limited space. This entry was posted in Kitchen, Kitchen Designs and tagged Indian Style Kitchen Design, Kitchen, Kitchen Cabinets, Kitchen Colors, Kitchen Design, Kitchen Design 2016, Kitchen Design Ideas, Kitchen Designs, Kitchen Designs for Indian Homes, Kitchen Designs for Small House, Kitchen Designs for Small Kitchens, Kitchen Designs for Small Space, Kitchen Designs Layouts, Kitchen Designs on a Budget, Kitchen Designs Photo Gallery, Kitchen Designs Photos, Small Indian Kitchen Designs, Small Kitchen Design, Small Kitchen Design Ideas, Small Kitchen Designs, Small Kitchen Designs for India, Small Kitchen Designs India, Small Kitchens by Homemakeover. Bookmark the permalink.